I have written before about archaeological excavations in Nazareth and sceptics who claim Nazareth didn’t exist as a village at the time of Jesus (and hence the gospels must be wrong) – see Did Bethlehem and Nazareth exist in Jesus’ day? and Nazareth re-visited. I have just come across some new information that was first published more than two years ago in an academic journal, but has now been written up in a more widely-read magazine. Dr Ken Dark has a PhD in archaeology from Cambridge University and is Associate Professor at Reading University. He has been doing archaeological work in Galilee for more than a decade, and has published several papers on his findings. In 2012 he published on the results of an excavation under the Sisters of Nazareth convent in the centre of the present city of Nazareth. A number of tombs and graves dated to the first century have been found in the vicinity of Nazareth. First century coins have been found at Mary’s Well in Nazareth (located about a kilometre from the convent site, and probably outside the ancient village), and there is some evidence of a Roman bath house nearby. On their own, these provide little conclusive evidence, but they add to the picture. The Nazareth Village Farm site is located nearby to the above sites, and was once a farm on a hill just outside ancient Nazareth. Excavations over the past decade have found several structures (a winepress, several watchtowers and agricultural terraces). Coins and pottery found at the site confirm that there was an agrarian community at Nazareth in the first century. In 2009, the Israel Antiquities Authority announced it had uncovered the remains of a first century house at the International Marian Center site nearby to these others. Artefacts again indicated the house was occupied in the first century, probably before 70 CE. Finally there is this latest excavation, indicating a house occupied in the middle of the first century. The conclusion of a number of archaeologists working in the area is that Nazareth at the time of Jesus was a small village of only a few hundred people, and possibly a little larger a few decades later. Agriculture was carried out nearby, the village’s water supply came from a spring not far outside, and some of the houses were built of stone. You would think that evidence would be pretty conclusive, but it isn’t that simple. There are sceptics who argue that Nazareth didn’t exist at the time of Jesus, and this is just another evidence that Jesus was a fictitious character. I’m not aware of there being any archaeologists among them, nor anyone who has worked on digs at Nazareth. The main spokesperson for this group is Rene Salm. They claim that the archaeologists working in this area are incompetent and/or biased (apparently they are accused of serving the cause of christian apologetics or Jewish tourism). They argue that the evidence points to later dates for all the remains discovered so far. However, in a location where so little of the area can be excavated, it is impossible to prove there was no occupation in the mid first century. The most they can hope to show is that the evidence is ambiguous. However the archaeologists have rebutted Salm’s claims and arguments, saying that in many cases his alleged facts are demonstrably in error, and the evidence is clear. Salm hints at conspiracy, especially when a paper he prepared was rejected by an academic journal. When it comes down to choosing who to believe, the qualified archaeologists or the inexperienced amateurs, there really is no choice. It is feasible that an amateur could pick up an occasional mistake by the experts, but when half a dozen professional archaeologists working on several different sites all come to the same conclusion, the cumulative evidence is very strong. René Salm’s claim that Nazareth did not exist in the days of Jesus is dead wrong and is rejected by every recognized authority – whether archaeologist, textual scholar, or historian; whether Jewish, Christian, agnostic, or other. It is hard not to conclude that the sceptics are being driven by ideology rather than evidence. Their continued unwillingness to accept the growing evidence reflects badly on their claims to base their views on rationality and evidence. Dark’s dating is based on the artefacts found at the site and the type of tombs found. Salm contests both. He argues that the artefacts found were not in locations that provide good dating evidence, but it is hard to see how he would know since he wasn’t there. The most he can say is that Dark hasn’t outlined the evidence in sufficient detail for Salm to draw a conclusion. The dating of these ‘kokhim’ tombs is complex and certainly beyond my ability to make judgments. Everyone seems agreed that there were kokhim tombs in Galilee in the first century, but Salm argues (I imagine correctly) that these tombs were in use for several centuries afterwards and were rare in the first century, so a later dating is more likely. But while that may be true, in itself it says nothing against the dating selected by Dark, based on a number of references. Salm seems to have taken the in-principle feasibility of a later date as evidence of a later date (which of course is not necessarily so), whereas Dark has based his conclusion on the evidence as he sees it. Again, he is the expert, he has investigated the site, and his fellow scholars apparently accept his expertise and judgment. Archaeological excavations continue where there is opportunity, and several of the digs listed above have not yet produced final reports. It will be interesting to see what evidence turns up next. It seems likely that the sceptics will find themselves on a small island of disbelief as the tide of evidence rises around them. It will also be interesting to see how they respond. Dr Ken Dark’s academic paper from Cambridge University, the text of that paper from Reading University, a recent article in the Biblical Archaeological Review, a summary of a talk he gave on this topic, and his Cv. 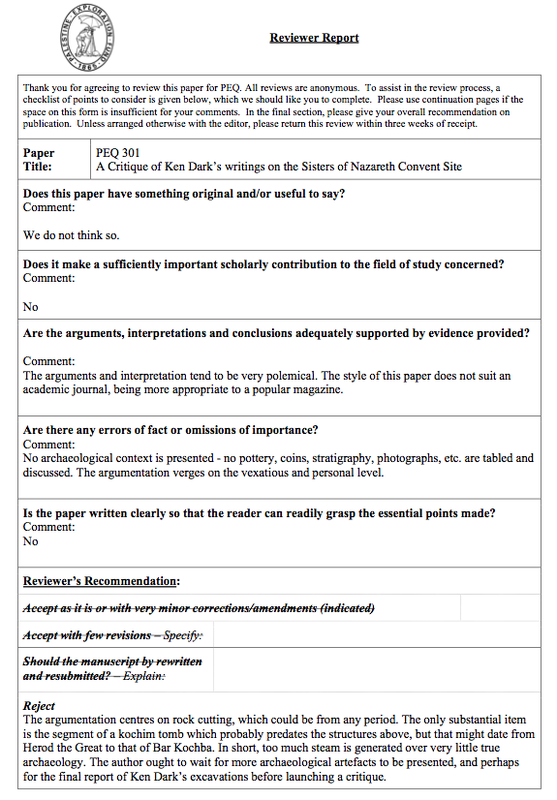 Rene Salm’s critique of Darks’ paper, his blog post on it being rejected for publication, and the rejection advice. A summary of Nazareth archaeology. Support for Dark from scholars Bart Ehrman (also here), Larry Hurtado and James McGrath. Israel Antiquities Authority announcement about the other Nazareth first century house. 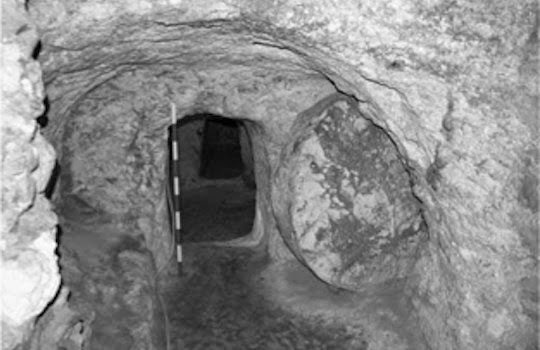 Picture: Tomb 1 from Ken Dark’s paper (photo by Dr Dark).